Spring is here again, the air is getting warmer after a long cold winter, and the robins have come back to us. Makers’ Market opens again after a winter’s rest, all refreshed with new products and welcoming new vendors and new customers. We look forward to greeting old friends and catching up on the news. Come have a coffee and maybe breakfast at The Hub, chat with the Makers’ Market vendors, and then have a wander around the Farmers’ Market across the street. We look forward to seeing you once again on Friday mornings, starting March 25, 2011. The month of June is already here – doesn’t time just fly? We at Makers’ Market are always busy creating for you, and we’ve been extra busy getting ready for the summer season. A walk around the Guild Hall on Friday mornings is sure to turn up some new finds. Smock-It was showing a cute little dress with flower trim last week, just one example of their careful needlework. Crow’s Nest has necklaces made of beach stones, as well as many with interesting bead work. Be sure to pick up a snack for Fido while you’re wandering through Makers’ Market. Cosmo Cookies has some very tasty peanut butter dog biscuits your little canine friend won’t be able to resist. Yester Year was displaying a plaid golf bag recently. There’s no telling what might show up at her table! A Touch of Clay created some elegant “Buddha bowls,” each with a handle and a word impressed on the inside. These delightful pieces of pottery could hold a steaming cup of tea, or perhaps a salad or bowl of soup. Karen of Gobsmacked Naturally decided to give back to the community recently, and donated some of her delicious and beautifully decorated cookies to a local cancer fundraiser event. Besides her tasty desserts she always has a great selection of freshly baked breads. Can’t you just smell them already? Shirley has been very busy sewing her quilts, always trying out new ideas with a variety of fabrics. Her microwave potato bags have been very popular. Nautical designs adorn a number of her quilted items lately. Karon’s detailed work with silver jewellery always impresses. Semi precious stones as well as shells and beach glass also are important parts of her collection. Why don’t you come out to see us at Makers’ Market, every Friday morning at the Guild Hall on Charlotte Street in Port Colborne, Ontario! The long weekend is finally upon us, the one that signals the start of cottage season, the time of both lighter days and clothing. Backyards are redolent with the heavy perfumes of deep purple lilac blossoms. It’s also an excellent time to stroll through the Friday’s Farmers’ Market to get some plants for your gardens and decks and balconies. While you’re there, why not cross the street to go into the Guild Hall to have a look around? 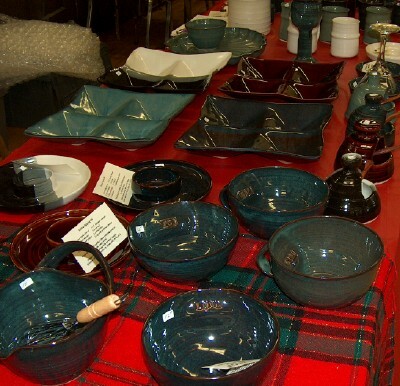 Makers’ Market offers a wonderfully diverse array of hand made delights. Who can resist these from "Gobsmacked Naturally"? “Crow’s Nest” had some new stone-with-wire pendant necklaces, as well as some lovely beaded earrings and bracelets. A bracelet & earrings from "Crow's Nest"
Blue earrings from "Crow's Nest"
Fleurette makes sock monkeys to please the child in us, and you should see her latest ones! 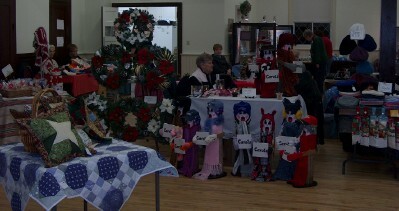 She makes not only sock monkeys, but also sock rabbits, sock elephants, and sock horses. Of course her sock monkeys are still very special! She often makes them in different costumes, and last week there were some in hockey uniform! A sock monkey in hockey uniform! You’ll find some pretty amazing bowls at “A Touch of Clay”, hand made by our potter, Mary. The colour accents are especially interesting. Come on out to visit us!